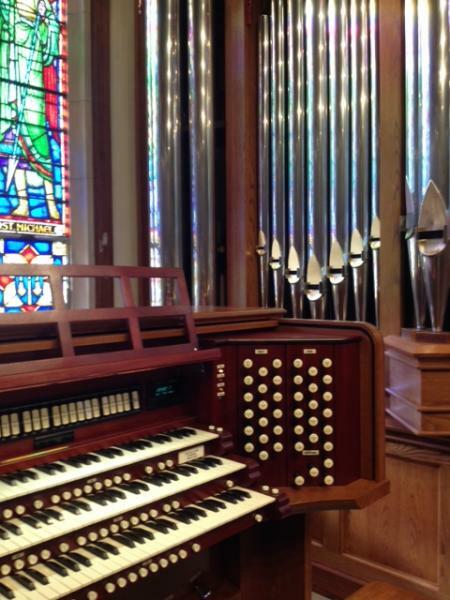 The new organ at St. Bridget Catholic Church in Richmond, Virginia is the 42nd new organ to come from the workshop of John-Paul Buzard Pipe Organ Builders in Champaign, Illinois. It was completed on October 1st 2013, and inaugurated by Ken Cowan in concert on November 15th. 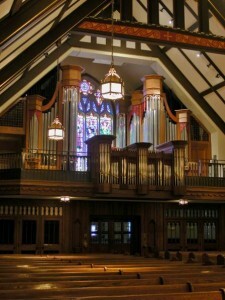 The organ’s visual design was guided by the Parish’s desire to re-claim a large stained glass window, which the former organ completely blocked. Pastor Monsignor William Carr, who began his clerical career at St. Bridget as the Assistant Pastor in the 1970’s, remembered the beauty of the occluded window, and began discussions with John-Paul Buzard in 2005 about the possibilities. The deteriorating mechanical condition and musical limitations of the previous instrument hastened the desire to proceed. 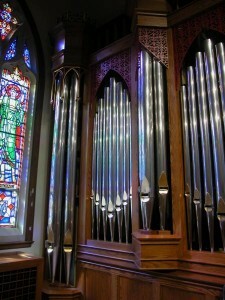 The Great Recession delayed the start of the project until the Parish raised all the funds to purchase the organ as their Bishop required. The Gallery’s floor space is quite limited and the window is large. But, the Church’s acoustical volume and musical needs required an instrument of a larger tonal size than that which would have been possible with a traditional design. This required some outside-the-box creative thinking, and resulted in our recommendation that the Great division be suspended over the Gallery rail, and that the enclosed divisions be thought of as more a divided Swell than independent Swell and Choir divisions. 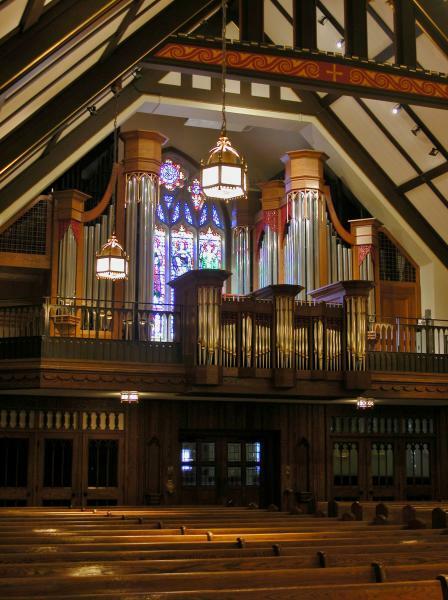 Area organist Grant Hellmers was invited to consult, and enthusiastically agreed that the design met both musical and architectural requirements. The Great’s profile is kept low in order to keep this portion of the organ below the field of glass. The formerly heavy wood railing was replaced with a more transparent wrought-iron rail. The two enclosed divisions are located in matching cases on either side of the window. The cases’ designs utilize shapes and details found elsewhere in the Tudor revival building. The result is that the organ cherishes the window, and that the Gallery and organ are architecturally integrated into the entire worship space rather than being set apart. Executive Vice-President and Chief Engineer Charles Eames created an instrument whose physical essence truly flows from the building, therein creating room for a larger instrument than the space would have otherwise held. With the new organ in place, the Gallery has an additional 100 square feet of usable floor space for the choir and other musicians, which it did not have previously. You’ll notice however that this is indeed a three manual organ. The three division design evolved from the original two manual divided Swell concept. The introduction of the 8’ Claribel Flute into what became a somewhat untraditional Choir Division, is what allowed the instrument to take on its three manual identity. 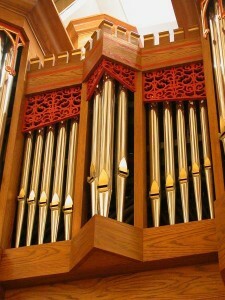 The organ exhibits a far greater variety of tone colors and pitch ranges than is typical of many instruments of its size. And, it has the uncanny ability to take on the appropriate tonal characters of various historical and national styles to fit the character of the musical composition. All of history informs and directs us in the evolution of our singular “Classically Symphonic” tonal style. The engineering, mechanical systems and pipe-making all support the artistic end result. The main manual windchests are all electrically operated Slider and Pallet chests. The chests for the unit stops have expansion chambers built into the very thick toe-boards, to replicate the winding characteristics of the Slider chests. 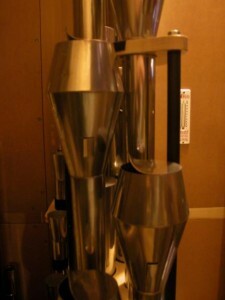 All of the pipes are made of high tin-content pipe metal, even in the bass, rather than zinc. The large pipes play promptly without having to use beards. The result is fullness and warmth without any hardness or inelegance of tone quality, all the way to the bottom of the compass. The Church’s acoustics change drastically when the room is filled with people, and the Church is nearly full every time the organ is used. Tonal Director Brian Davis ably met the challenges which this condition presents by scaling and voicing the instrument for optimal performance when the room is full. The result is that the organ is never too loud, but it fills the room with sound even when played softly. 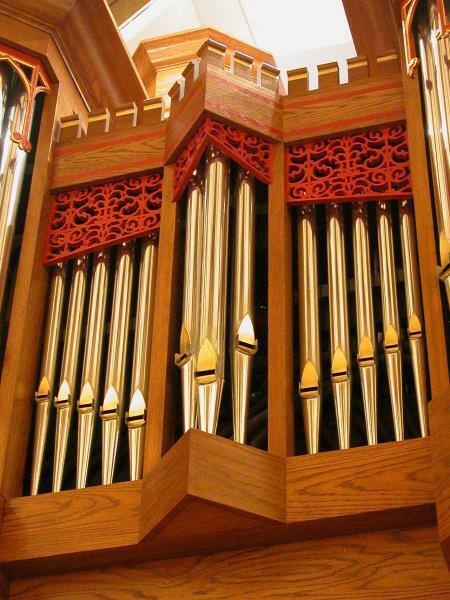 An entire congregation can be supported in its singing with a single 8’ Diapason; the strings are voluptuous and shimmering; the haunting Flute Cœlestis provides an air of mystery; the Choir reeds provide some of the most beautiful cantabile colors imaginable; the smooth and stately Tuba soars above Full Organ. Nearly every stop can be used with any other to create a new musical color. Superior tonal design, sensitive voicing and painstaking tonal finishing result in the exquisite blend and balance of the individual stops and their choruses, relating to both themselves and to the room. And, as Ken Cowan demonstrated to the delight of his audience, there are many ways that this instrument can render seamless dynamic changes. As is the case with all Buzard Organs, symphonic color and romantic warmth never sacrifice sprightly clarity and transparency of tone for rendering polyphonic music. The Church’s growing music program is under the direction of Mr. Allen Bean. The children’s program, which Mr. Bean instituted and includes both boy and girl choirs, has performed at the Kennedy Center in Washington DC, and the Lincoln Center in New York. 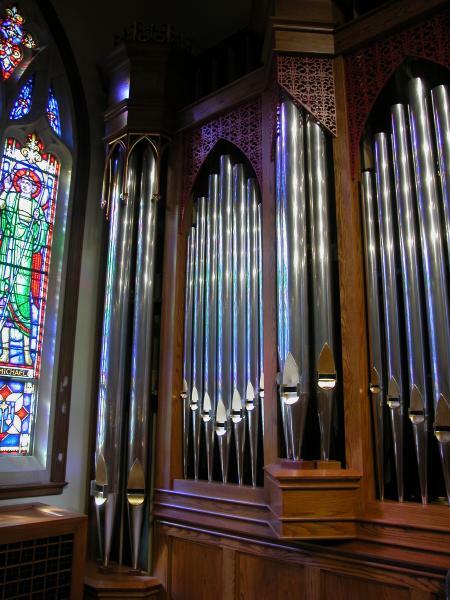 Thanks to the staff of Buzard Pipe Organ Builders whose professionalism shines forth in all the work we undertake!